The proximal tibial osteotomy is appropriate for correcting angulatory deformity and combined deformities of angulation and rotation. Simple rotational deformity is best performed in the distal tibia, as proximal osteotomies have a higher rate of complications. 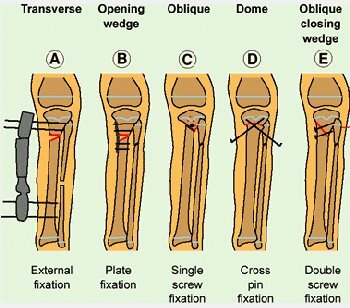 Select the best osteotomy and fixation for your patient from the several techniques available. Transverse osteotomy with external fixation This technique is ideal for management of tibia vara in the obese child. Cast supplementation is not necessary, correction can be gradually applied and easily modified, and monitoring compartment and nerve status are simplified. Transverse osteotomy with plate fixation This technique is useful when combining angular and rotational correction. Oblique osteotomy provides correction in both rotation and angulation. Calculate the angle for osteotomy before the procedure. The osteotomy is made from an anterior exposure with the entry point just inferior to the tibial tubercle. The osteotomy extends proximal and posterior at an angle necessary to correct both rotation and varus or valgus components of the deformity. Fixation is relatively simple with a single AP screw. The large contact area increases the rate of union. Dome osteotomy provides good contact with inherent stability, making fixation with crossed pins adequate. Oblique closing wedge osteotomy provides a large contact area for rapid union and allows fixation with two transfixing screws. Complications of the proximal tibial osteotomy are relatively common. These include peroneal nerve injury, compartment syndromes, and physeal injury. Be aware of the anterior distal extension of the growth plate and make certain the osteotomy or fixation devices do not traverse the plate. In rare instances, the peroneal nerve may be tethered, and mobilization may be necessary to avoid excessive stretch. For most osteotomies, several steps are appropriate. Prophylactic anterior compartment release Divide the fascia of the anterior compartment subcutaneously through the osteotomy incision. Perform a fibular osteotomy, split the cast, and in the immediate postoperative period, follow carefully for evidence of peroneal injury or compartment syndrome. Bilateral tibial osteotomies in renal rickets. Valgus osteotomy with external fixation for tibia vara in obese adolescent. Simple transverse osteotomy before plate fixation.